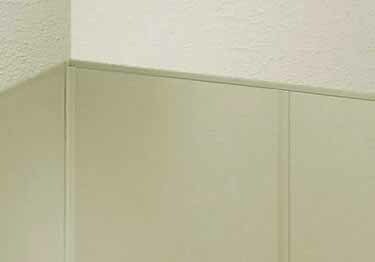 Protect your walls from damage and eliminate never-ending costly repairs from scratches, dents and scrapes with these rigid, durable wall panel strips and rolls. Available in 2 thicknesses and over 100 color options InPro®''s rigid wall protectors give you the look you want without sacrificing protection. For the perfect seamless finish purchase the inside corners, top caps, vertical dividers and matching vinyl seal. 4' x 8' rigid vinyl wall guard panels come in two thickness: .040" and .060"
Rub rails available in .040" or .060" thickness in the following sizes: 4"x96", 6"x96", and 8"x96"
Rigid Panel Sizes: 4 ft. x 8 ft. Rolled Sheet Sizes: 3 ft. x 50 ft., 3 ft. x 100 ft., 4 ft. x 50 ft., 4 ft. x 100 ft.
Rub rail sizes: 4 in. x 96 in., 6 in. x 96 in., and 8 in. x 96 in. Inside corners, top caps, vertical dividers have vinyl construction and are available in standard colors. Protect your walls from damage and eliminate never-ending costly repairs from scratches, dents and scrapes with these rigid, durable wall panel strips and rolls. Available in 2 thicknesses and over 100 color options Inpro®''s rigid wall protectors give you the look you want without sacrificing protection. Complete your wall panel, strip, & roll installation. Used to fill joints & seams. 92 colors, & comes in a 10.5 oz. cartridge.